Motorbike Tour in Nepal with Pink Mountain Treks and Expedition is one of the fantastic adventure package tours for stunning Himalayan views, lush valleys, reach different type of ethnic groups and tribal society, marvelous terrace fields, temples & monasteries. 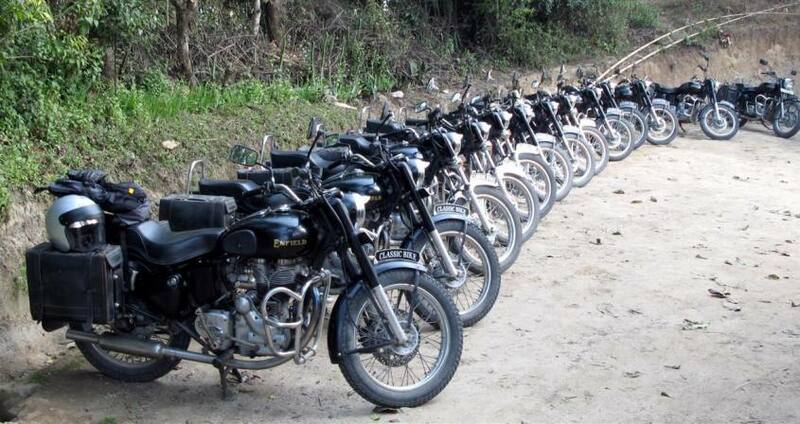 We use Royal Enfield or Honda XL motor bike as customers’ choice. A Motorbike Tour that puts you at ease with not much taxation to challenge yourself here is an experience the serpentine roads keep you wondering as to what is next road bend like, but at the same time metalled road condition keep the bike moving at a regular pace with a good relaxing. Motorbike tour in Nepal is for those adventure explorer who are looking for an insight into the rural life of Nepal with a great view of the evergreen forests of the Himalayas and beautiful temples and monasteries. The motor biking tours programs that can be possible to great short and long as your wish. When you ride with the leader in off-road motorcycle adventures in Nepal, you'll enjoy the finest customer service available and the challenge of off-ride rugged beauty riding. This is not just another "tour", it is an Adventure tailored to your desires. Day 3Kathamndu - Chispani - Roheni Bhanjayang - Dhulikhel Morning after breakfast our riding starts from Kathmandu passing through a famous Hindu site "Budhanilakantha" and Shivapuri Water Reserve then ascending to "Chisapani" (meaning- cold water in Nepali) at an elevation of 2500 meters, the first day camping place of Langtang/ Helambu trekking route. The road is bumping and beautiful surrounded by the sub-tropical jungle and the villages. We continue drive to "Roheni bhajyang" from where the clear view of the Kathmandu valley can be seen. The most important panoramic views of high Himalayas to the North are always fascinating. Day 4Dhulikhel - Timal Besi via Palanchok Bhagawati - Dhulikhel After breakfast in Dhulikhel lodge, riding starts 8 AM as usual. Riding soon after 15 Kilometers paved road, we will enter to a branch road to the North-East direction. Riding along the mountain in between of the beautiful villages, we'll enter to the valley of famous Sunkoshi River. Enjoy riding small track with sounds of river and dramatic landscape. On the way back to Dhulikhel we will drive to famous famel God Bhawati temple on top of the hill. Day 5Dhulikhel - Timal Danda via Panchkhal - DhulikhelAfter breakfast in Dhulikhel lodge, riding starts at 8 am. Descending about 10 km you will enter the huge Panchkhal valley and drive through fields of paddy and traditional villages. Straight ahead you will see a mountain in the shape of an elephant, cut in two by the rivers Sun koshi to the north and Rosi Khola to the south. Right before ascending you will cross a small stream called Jheau Khola and enter a sub-tropical forest, to reach the hilltop at about 2100 metres. Timal Danda is a majority Tamang settlement with small populations of Newar, Chhetri and Magar as well. The view from the top is amazing with high Himalayas to the north and Mahabharat ranges to the south. You will take in these views all the way as you drive along a ridge to the village of Pauwa. On the way back from Pauwa we will take a part different off-road track to Dhulikhel for a change of scenery. Day 6Dhulikhel - Namo Bhddha - Dapcha - Dumja - Dhulikhel Our riding stsrts in the morning as usual to Eastern side of Dhulikhel. Riding few kilometers in paved road we'll reach at the gravelled road at the side of a small river called "Rosikhola" which joins with Sunkoshi river after 45 kilometers down. As we already drive other side of Timal Danda the valley of Sunkoshi called Timal Besi, today's riding is another narrow valley of Rosi Khola. On the way back we will ascend to another beautiful town "Dapcha" from where we will see the beautiful himalayan range and the hills, villages around including Buddhist Stupa and Hindu temples. Day 7Dhulikhel - Dhungkharka via Panauti - Phulchoki - Kathamndu Our riding starts at 8'O clock after breakfast at the hotel. We'll ride to Namobuddha then panauti and straight to Dhungkharka passing through villages, stream and sub-tropical jungles.. the road is recently constructed track leading across the Mahabharat range . The last day of riding through Nepal's rolling hills, sub-tropical jungle, paddy fields and ancient city and villages make your off-road riding a life time experience that will be full of fun and joy. In the evening we'll celebrate with a farewell dinner together take a well-earned rest. Day 8Fly out. Pink Mountain Treks and Expedition's representative will drop you at airport before Three hours of your flight schedule.